During May 2011, an archaeological survey was conducted north of the Kuseifa township in the Negev (License No. S-278/2011; map ref. 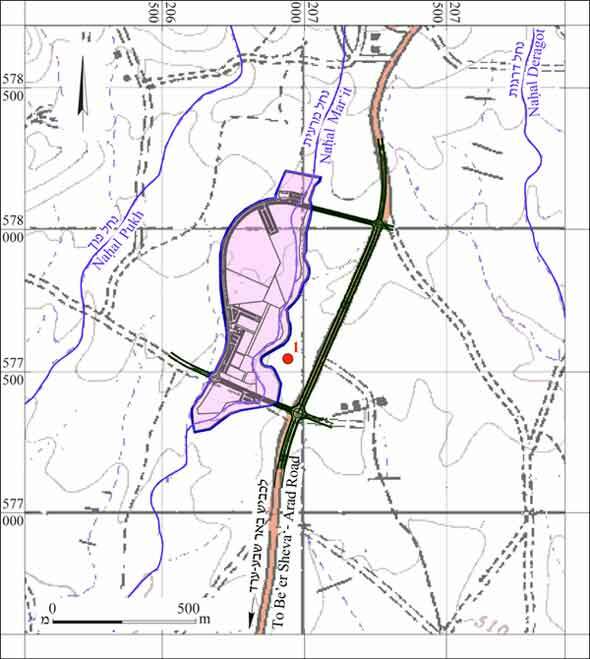 2065–70/5773–82), prior to the construction of a service center for the Bedouin settlements. The survey, undertaken on behalf of the Israel Antiquities Authority and underwritten by the Abu Basma Regional Council, was performed by N.S. Paran and F. Sonntag, with the assistance of S. Gal (GPS). The survey region, in a valley at the foot of the ‘Ira mountain ridge in the Nahal Mar‘it flood plain, is characterized by clay alluvium. The local residents extensively cultivated the region in the modern era and much of it has therefore been disturbed. No archaeological sites were discovered in the survey. A watchman’s hut (map ref. 206931/577557; 4×4 m; Fig. 1:1) is located next to the survey area and potsherds from the Ottoman period are found around it.